The following group of producers are offering releases from the 2007, 2008 and 2009 vintages that are easy to recommend. Gary Farrell has been crafting wines in the Russian River Valley since the early 1980s, starting his own eponymous label in 1982. He was to sell his label and Westside Road winery to Allied Domecq in 2004. The winery then passed through several corporate hands, including most recently in 2011, The Vincraft Group. Farrell left his eponymous winery in 2006 and partnered with Bill Hambrecht to found Alysian Wines. The latest venture, promises “no compromise” Chardonnay and Pinot Noir from Russian River Valley sources. The inaugural releases were from the 2007 vintage. A 2008 Starr Ridge Vineyard Chardonnay will be reviewed in a separate part of this newsletter. The 2008 vintage marks a return to a more elegant style of wines for Gary Farrell. He notes in his latest newsletter, “Many consumers and winemakers are beginning to favor a more elegant and refined style of wines. It is not that we seek less flavor, texture or depth, it’s simply that we understand abundance and generosity in wine is achievable without excessive extract and alcohol.” If he wasn’t so modest, he could have remarked that this stylistic goal is something he has sought after and achieved for nearly 30 years. The two wines reviewed here are the best yet from Alysian. 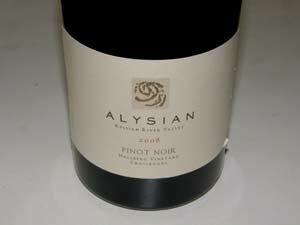 My only nit with the Alysian wines is the ridiculously heavy bottles that don’t fit into my wine cellar racking. Alysian wines are sold through a mailing list at www.alysianwines.com. 14.2% alc., 160 cases, pH 3.46, TA 0.67, $55. · Moderate reddish-purple color in the glass. Really impressive fruity nose offering vibrant aromas of ripe cherries and strawberries with hints of graham, BBQ and sandalwood. Mid-weight essence of fresh cherries and strawberries with a subtle nutty note in the background from oak. Dry, fine-grain tannins provide support for this pretty wine that exudes charm. Very Russian River Valley in character, a more restrained interpretation of this vineyard source, and a wine of exemplary pinotosity. 14.2% alc., 157 cases, pH 3.43, TA 0.69, $55. · Moderate reddish-purple color in the glass. Darkly fruited with aromas of graham and spice. Black cherry, black raspberry and strawberry flavors with the slightest hint of oak show up in a moderately rich format with restrained tannins, brisk acidity and a refreshing, slightly brambly finish. The silky soft composure is appealing. Much better the next day from a previously opened and re-corked bottle, when my wife and I finished the bottle over dinner. Owner and winemaker Kenneth Juhasz produces small lots of Pinot Noir from California (Manchester Ridge and Sonoma Stage vineyards) and Oregon (Hyland and Shea vineyards) as well as Chardonnay (Durell, Hyde Donum and Hanzell vineyards in various vintages) in Santa Rosa, California. The word, Auteur, translates as “author.” Juhasz has a background of over sixteen years in winemaking in California, Oregon and New Zealand. Along with Auteur, Juhasz consults with several wineries, including Donum Estate, Pali Wine Company and Semper. Auteur was launched ten years ago and with the 2009 vintage has revised the label and logo to create a more sophisticated package. I find the change welcoming. 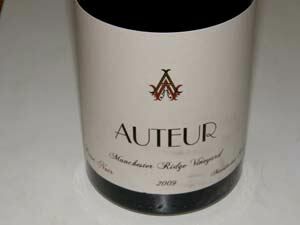 Auteur wines are sold through a mailing list at www.auteurwines.com. 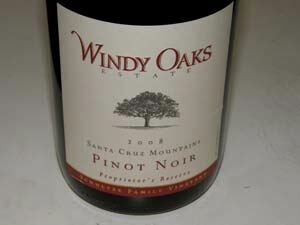 Spring releases, in addition to the wines reviewed below, include a 2009 Sonoma Coast Pinot Noir, 2009 Durrell Vineyard Chardonnay, and 2009 Sonoma Valley Chardonnay (Hanzell Vineyard). 14.6% alc., 91 cases, $38. Originally a blend of California and Oregon Pinot Noir grapes, but now a singular Willamette Valley blend. Four barrels from Shea Vineyard that did not fit into the Shea and Shea Back Block bottlings for 2009. Aged in 100% neutral French oak. · Moderately dark reddish-purple hue in the glass. Very ripe fruit profile with aromas of spiced black cherries and black raspberries and baking chocolate. 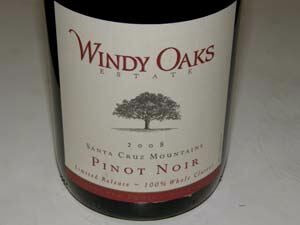 Moderately intense flavors on the mid palate featuring dark cherries and berries with some spice and oak underpinnings. The tannins are restrained and the wine offers early drinkability. A little heat shows up on the finish. Good. 14.6% alc., 195 cases, $60. 90% de-stemmed, 10-day cold soak, minimal cap manipulation, 7- day post fermentation maceration, aged in new and 1-year-old barrels. · Moderately deep reddish-purple color in the glass. Subdued nose, picking up interest with time in the glass to reveal aromas of dark berry jam, dark chocolate and well-perfumed flowers. Tasty melange of blue and black berry fruits with subtle oak highlights and a lively acid grip on the finish. Picks up intensity with time in the glass. The fruit is obviously classy, but nothing stands out at this stage. Still very good the following day from a previously opened and re-corked bottle. Not as approachable as many 2009 Oregon Pinot Noirs, this wine will benefit from more cellaring. Very good (+). 14.2% alc., 182 cases, $50. Clones 115 and 777 co-fermented. Yield about 2 tons per acre. 20% whole cluster. Aged 16 months in 50% new French oak barrels. · Moderately deep reddish-purple color in the glass. 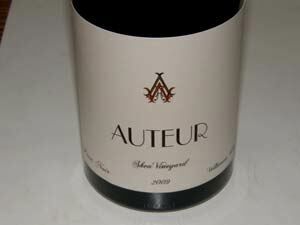 Demure, but seductive perfume of fresh black raspberries, black cherries, spice and vanilla wafers. Perfectly composed and seamless with delicious flavors of berries and bright cherries accented by notes of cola, baking spices and mocha, wrapped in silky tannins. Plenty of vim and vigor with impressive persistence on the long finish. Still great the next day from a previously opened and re-corked bottle predicting a long life ahead. I have had several stunning wines from this vineyard. One of my All-Americans for 2011. 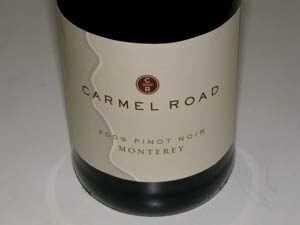 Carmel Road Winery is part of the Jackson Family Wines group and was founded in 1997. Located in Monterey County, Carmel Road has access to a large group of vineyards in the Salinas Valley including Rincon, Hacienda and Clark Ranch, and employs a mix of proprietary and traditional Burgundian winemaking techniques to produce Pinot Noir, Pinot Gris, Riesling and Chardonnay wines of consistently solid value. Winemaker Ivan Giotenov has more than 110 unique lots from which to create his final blends. 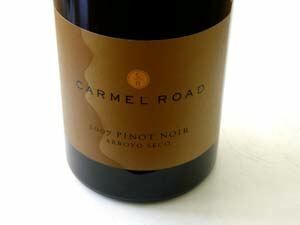 The wines can be purchased online at www.carmelroad.com. A search may find the wines in retail wine stores discounted below retail price. 14.0% alc., pH 3.73, TA 0.54, 44,255 cases, $20. Released October 2010. Aged 9 months in 17% new French oak barrels, 3% new American oak barrels and 1% stainless steel tanks (1% Chardonnay in blend). Sourced from Panorama, Porter, Clark, Mission Peak and Mission Trails vineyards. · Moderate reddish-purple color in the glass. Nicely perfumed with an array of fresh berries. Brisk and juicy with a middle-weighted core of cherry and berry fruits, with a hint of cola, oak and citrus in the background. Soft with silky tannins. A solid daily drinker at a reasonable price. Good. 14.5% alc., pH 3.75, TA 0.54, 626 cases, $35. Clones 2A, 115, 667 and 777. The Clark Ranch lies in the shadow of the Santa Lucia Mountains. Most of this 1,100-acre vineyard is planted to Chardonnay with 34 acres dedicated to Pinot Noir. This limited bottling comes from a special, 4-acre block at the heart of the ranch that consistently yields a deep and compelling Pinot Noir. Cold pre-soak, native yeast fermentation, hand punch downs, and no fining or filtration. Aged 10 months in 39% new French oak barrels. · Moderately dark reddish-purple color in the glass. Enticing aromas of dark raspberries and blackberries, black cherries, kirsch, brioche and oak. Discreetly concentrated flavors of chocolate-covered, perfectly ripe cherries, and fresh blackberry jam. The vivid fruit is nicely caressed by fine-grain tannins, the oak is beautifully integrated, and there is impressive aromatic persistence on the fruit-filled finish. Very good. 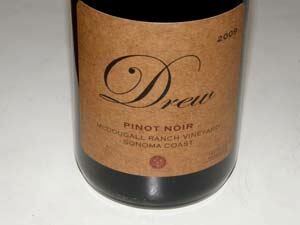 Jason Drew and his wife Molly founded the Drew label while Jason was an associate winemaker at Babcock Vineyards & Winery in 2000. In 2002, Jason left Babcock to concentrate on his own label. The Drews acquired a 26-acre ridge top property in the Mendocino Ridge appellation that was once a noted apple orchard. A winery and home was built on the property and vineyard land was cleared among the apple trees with the intention of future plantings of Pinot Noir. Pinot Noir grapes have been sourced from the Anderson Valley (Fog Eater, Savoy Vineyard, Monument Tree Vineyard), the Sonoma Coast (McDougall Ranch Vineyard), Mendocino Ridge (Valenti Vineyard, Perli Vineyard, Mendocino Ridge Vineyard), and the Yorkville Highlands (Weir Vineyard). Vineyard sources have been in flux due to vineyard ownership changes and grape availability that have ensued over recent years. Production of Pinot Noir (and Syrah) is 1,800 cases annually. Jason is a talented young winemaker whose wines have caught me eye for several years. The wines are sold on the website, through a mailing list at www.drewwines.com, and through limited retail distribution. A tasting room is located at 9000 Highway 128 in Philo, just northwest of the Goldeneye Winery (open Thursday thru Monday from 11:00 to 5:00). Molly Drew is pictured below at harvest. Both wines reviewed below were recently released. 14.2% alc., pH 3.62, TA 0.67, 450 cases, $28. Released February 2011. 60% Perli Vineyard and 40% Mendocino Ridge Vineyard. Clones 114, 115, 777, 667. 100% de-stemmed. Aged 11 months in neutral French oak barrels. · Pleasant and complex array of aromas including red and black berries, black currants, raisin, cedar and savory herbs. Slightly tart flavors of cherry skins, pomegranates, and black raspberries with a savory bent. Crisp with restrained dry tannins. Easily approachable now. Better the next day from a previously opened and re-corked bottle. Good (+). 13.7% alc., 183 cases, pH 3.65,TA 0.64, $47. Released March 2011. A 7-acre vineyard on a rocky outcropping at 935 feet elevation about 2.4 miles from the Pacific Ocean in the true Sonoma Coast. Fifth vintage from this site. Soil is sandy clay over bedrock. Clone 114. 30% whole cluster fermentation. Aged 11 months in 30% new French oak barrels. · Deeply and intensely perfumed with scents of wild berries, spice and cedar closet. Luscious core of blackberry, boysenberry, and black cherry flavors wrapped in flamboyant tannins. Fruit is perfectly ripe and has an exotic, animale quality. Amazing persistence on the big finish. Great potential. Better the next day from a previously opened and re-corked bottle. A top notch producer of West County Chardonnay and Pinot Noir owned by Joseph Phelps. The estate consists of a large winery in Freestone, and three vineyards: Pastorale, Quarter Moon and Ferguson. The Director of Winemaking is Phelps veteran Damien Parker, the Winemaker is Theresa Heredia, and the consulting winemaker is Burgundian Pascal Marchand. Fogdog Pinot Noir is a blend of grapes from the estate vineyards, approachable early, and reasonably priced. 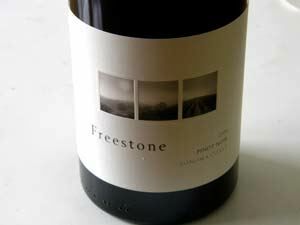 The Freestone Sonoma Coast Pinot Noir is a premium bottling of grapes from the estate vineyards. The wines are distributed to fine restaurants and sold through the tasting room in Freestone, the website at www.freestonevineyards.com, and the winery’s wine club, the Freestone Private Collection. I have had some remarkable wines from this producer. 14.0% alc., 3,900 cases, $55. 100% estate-grown from Pastorale and Quarter Moon vineyards. Aged 14 months in 60% new and 40% 2 to 3-year-old French oak barrels. · Moderate reddish-purple color in the glass. Lovely aromas of black cherries, exotic spice, brier and cut flowers with a slight hint of tobacco smoke, picking up interest and intensity over time in the glass. Black cherry-driven flavors with pleasing oak and whole cluster spice, slightly dwarfed at this stage by oak. Like cherry pie day at cooking school - cherries, baking spices and very interesting results. A solid wine that will improve in the cellar due to its impeccable structure. Very good (+). David Hirsch was one of the first visionaries to plant Pinot Noir on the true Sonoma Coast and now farms 68 acres of Pinot Noir and 4 acres of Chardonnay. The first two acres date to 1980. A winery was built on the property in 2002. Hirsch supplies fruit to many prominent California wineries including Failla, LIOCO, Littorai, Siduri and Williams Selyem, and bottles both Pinot Noir and Chardonnay under the Hirsch Vineyards label. The current winemaker is Ross Cobb. 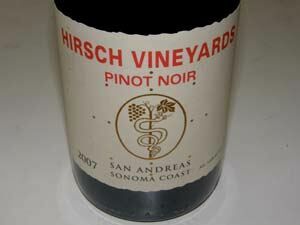 The wines are sold by a mailing list at www.hirschvineyards.com and through limited retail distribution. 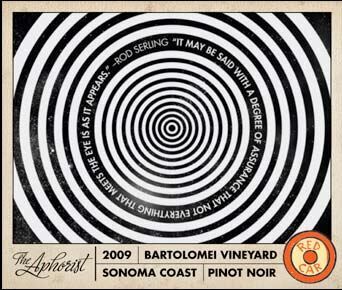 The Hirsch Vineyard Estate bottling is named San Andreas beginning with the 2007 vintage, a reference to the location of the vineyard on a seismic fault that lies between Hirsch Vineyards and the Pacific Ocean (the prime cause of the property’s geology and topography). 14.0% alc., $60. · Moderately light reddish-purple color in the glass. Very lovely aromas of a wild berry mix with accents of spice and oak. Wow! A mid weight core of dark red cherries and berries coats the mouth, uplifted with bright acidity that leads to a refreshingly juicy finish. A seamless wine lover’s wine with charming elegance that should age gracefully. 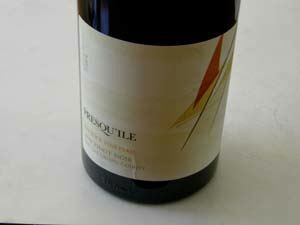 Presqu’ile (“press-KEEL”) is a small new winery launched with the 2009 vintage. Located in the Santa Maria Valley, the winery is owned by the Murphy family whose gathering place on the Gulf Coast was named Presqu’ile, Creole for “almost an island.” The Murphy family have partnered in farming, forestry, oil and gas, and conservation for four generations. Today, two generations of Murphys joined with winemaker Dieter Cronjie and vineyard manager Jim Stollberg, to produce Presqu’ile wines. The estate is located between the Pacific Ocean and the San Rafael Mountains near Solomon Hills Vineyard and consists of 73 acres of certified sustainably farmed vineyards on a 200-acre property. Production centers on Pinot Noir, Syrah, Chardonnay and Sauvignon Blanc from the estate vineyard and from top growers in Santa Barbara County. The stylistic goal is to pick at relatively low Brix, producing wines of moderately low alcohol. 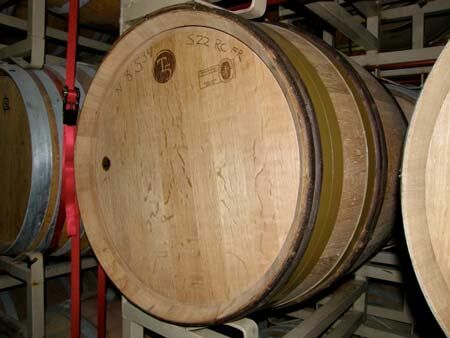 The wines are fermented exclusively with native yeast and most wines are barrel-aged in 75% neutral French oak barrels. A stunning winery and tasting room is slated for completion in 2012. 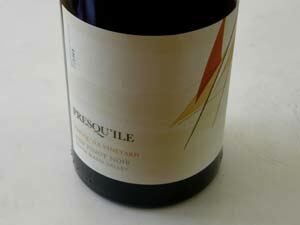 The wines are sold online at www.presquilewine.com and through retail channels. This is an up and coming producer with great promise as the estate vineyard plantings take on some age. 13.7% alc., $42. 35% whole cluster, native yeast primary fermentation and native malolactic conversion. 56% Presqu’ile Vineyard and 44% Solomon Hills Vineyard. Clones 667, 115, Pommard and 777. Aged 14 months in 20% new French oak barrels. · Moderately dark reddish-purple color in the glass. Shy aromatics revealing demure scent of kirsch and mixed berries. Simple and direct flavors of black cherries and berries with a hint of spice, lively acidity and moderate fine-grain tannins. A good daily drinker. Decent. 13.7% alc., 350 cases, $Unreleased. Best 12 barrels. 40% whole cluster. Native yeast fermentation and native malolactic conversion. Aged 14 months in 50% new French oak barrels. · Moderate reddish-purple hue in the glass. Demure aromas of dark red fruits, spice and subtle oak. Tasty array of dark red berries and cherries with well-proportioned supporting t n’ a. Soft and smooth like the hair of an angel. Much better the next day from a previously opened and re-corked bottle showing plenty of signature Santa Maria spice. Needs a little more time in bottle. Very good. 13.7% alc., 150 cases,$Unreleased. Only winery to receive grapes from this vineyard which is located 8 miles inland in southern San Luis Obispo County. 2 acres of own-rooted Dijon clones 667 and 115. Rocky soils and cool climate limit yields to less than 2 tons per acre. · Moderate reddish-purple color in the glass. Starts off strong with vibrant aromas of dark stone fruits, fading some in the glass as oak and green notes take over. The most intense, and showing the most fruit impact in the mid palate of the three wines reviewed here. Soft and smooth with notable tannin and oak presence, finishing with some persistence. Picks up appeal over time in the glass. A little disjointed now and will benefit from a year or two in the cellar. Good (+). A winery originally launched in 2000 by two Los Angelino wine lovers, Mark Estrin and Carroll Kemp. The style and theme of the wines have changed dramatically over the years, with Kemp carrying on the management and contributing to the winemaking after Estrin passed away in 2005. The focus of the winery now single vineyard Pinot Noir from the true Sonoma Coast where Red Car planted the Red Car Estate Vineyard in 2005 and sources fruit from other top notch cool sites. The wines have become less bold (the first Red Car Pinot Noirs were fashioned like Syrah) and more site specific with better balance and more nuance. Carroll emphasizes the importance of tension in wine: the coexistence of alcohol, acid, tannin and fruit in harmony. The website (www.redcarwine.com), newsletter and labels are among the best in the business. Second labels, which are value priced, include Boxcar and Trolley which complement the reserve single-vineyard Pinot Noirs. The reserve wines are sold primarily through a mailing list. A new tasting room is open in Graton on Gravenstein Highway in the Green Valley area of the Russian River Valley. I would be very happy to have any of the three wines reviewed here in my cellar. Each of the wines will benefit from more time in the cellar. 14.1% alcohol, pH 3.76, TA 0.58, 360 cases, $60. Released April 2011. Fourth release from this vineyard located northwest of Forestville. Clones 113, 777 and Jackson 16. Very low vigor, less than 2 tons per acre. 6% whole cluster. Native fermentation. Aged 11 months in 27% new French oak barrels. · Dark purple in color in the glass. The aromas really come at you with vivid notes of spiced stone fruits, dark berries and complimentary oak. Delicious, moderately intense dark fruit core, featuring appealing plum and spice flavors with a subtle oak note. Bright and juicy, with the tannin and acid backbone for long term enjoyment. Seamless with notable persistence on the finish. Still solid the next day from a previously opened and re-corked bottle. Very good. 13% alc., pH 3.66, TA 0.573, 90 cases, $60. Released April 2011. An extreme site that struggles to set fruit. Calera, 777 and 828 clones. Densely planted and farmed intensively. 5% whole cluster. Native fermentation. Aged 15 months in 25% new French oak barrels. · Moderate purple color in the glass. The most intense aromatics in the lineup with charming aromas of black cherries, black raspberries, plums, exotic spices including cardamom and even dried rose petals and a hint of fecundity. Intensely fruited on the palate with a panoply of cherry and berry flavors that play off each other and dance on the palate. Notable tannins at this young age, but silky and light on its feet. 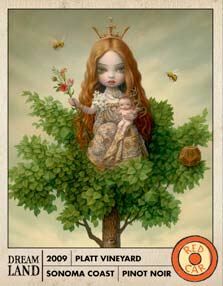 My only nit is a very slight green note which I attribute to a slight under ripeness or oak. Very good. 14.2% alc., pH 3.74, TA 0.58, 340 cases, $65. Released April 2011. 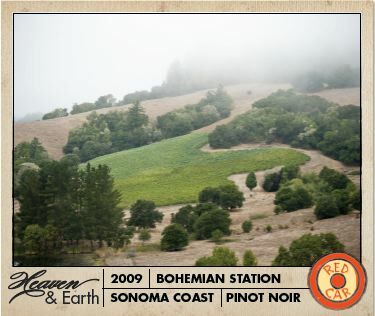 From the 4.5-acre La Boheme Vineyard located less than one mile from the town of Occidental. Planted in 2004 to Calera, Pommard and Dijon 828. A sheltered cool site. Native fermentation. Aged 15 months in 41% new French oak barrels. · Moderate purple color in the glass. Takes some coaxing to bring out aromas of black raspberries and forest floor. Flavors of earth-kissed black fruits build in intensity over time in the glass. The lightest in weight of the Red Car reserve Pinots, but the most charming fruit profile. A killer the next day from a previously opened and re-corked bottle. Still simple and relatively backward, so patience is advised. Open this beauty in three years and you will wish you had bought more of it. Wines like this fuel my passion for Pinot Noir. Owner Kevin Harvey is a Burgundy fanatic and he has spared no expense to stake a claim to “Beaune in the USA” in the Santa Cruz Mountains. He now has five vineyards in the Santa Cruz Mountains region and a vineyard in Anderson Valley. 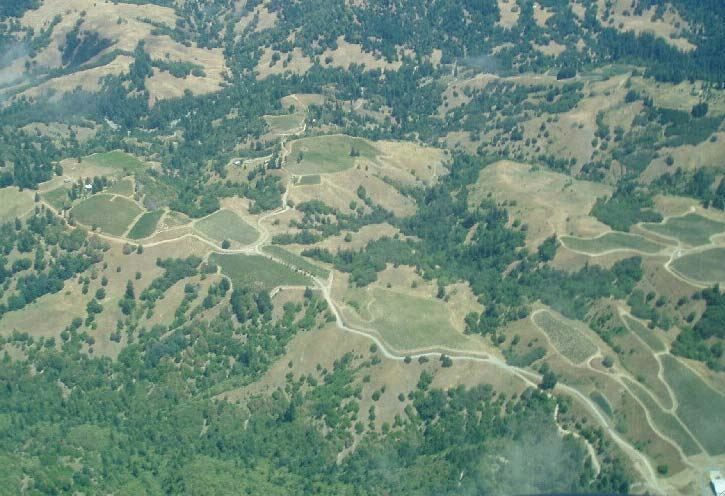 2007 was the first vintage in which all five Santa Cruz Mountains vineyards were in production (Home, Family Farm, Alpine Road, Horseshoe Ranch and Skyline). 2008 was the first vintage from Bearwallow Vineyard in the Anderson Valley. The focus is on Pinot Noir and Chardonnay produced from primarily heritage and suitcase clones and the wines are some of the most distinctive terroir-driven examples produced in California today. The talented winemaker is Jeff Brinkman. A new 30,000 square-foot underground winery at Skyline Vineyard in the Santa Cruz Mountains was finished in 2010. This is a world apart from the 4-car garage next to Home Vineyard where the first two commercial vintages of 2004 and 2005 were produced.The wines are in the cult category, highly allocated and sold only through a mailing list. Allocations are based on aggregate purchase history. Visit the website at www.rhysvineyards.com for more information and to join the list. 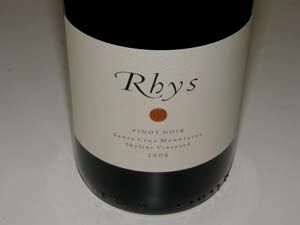 Small amounts of Syrah and magnums of Rhys Pinot Noir are also released. I find it very challenging to evaluate young or closed wines and predict how they will evolve in years to come. It would take someone a lifetime of tasting many vintages of one producer to be able to have predictions that would have predictable validity for that producer. I feel like I have became a fairly good judge of potential but I am the first to admit that it is far from an exact science. I look for balance primarily, because this is an excellent predictor of age ability, although some wines that are not in balance may become so over time. I often taste wines the day after opening a bottle and the following day, and even several days later after they are opened to get a feel for age worthiness. My evaluations are based primarily on the way wines are drinking the day they are opened, with some weight given to potential if it is reasonably assumed. It is clear some wines that are rated “Good” or “Very good” will at some future moment achieve my highest “Pinot Geek” accolade or vice versa. My reviews are dated, so readers can understand how the wine tasted on that date, and along with my recommendations when appropriate, make their own decisions regarding future improvement and drinkability. Fortunately, most consumers drink their wines when relatively young, so my ratings are of practical value. 12.8% alc., $59. 10.85 acres, 1450’-1610’ elevation with 20%-25% slope. Suitcase clones (Swan, Calera and La Tache). 18”-24” rocky top soil over Monterey shale. Yield .7 tons per acre. · Dark reddish-purple color in the glass. Shy nose initially, opening over time to reveal enticing aromas of dark cherries and raspberries, Chinese Five Spice and faint oak. Luscious black raspberry fruit buried in prodigious tannins and bright acidity. About the same the following day from a previously opened and re-corked bottle. I get the feeling this wine will be significantly better in another 3 to 5 years. Very good. 12.2% alc., $69. 2.12 acres at 2280’ to 2375’ with 20%-35% slope. Mixed suitcase clones closely planted. 2”-4” of top soil over Lorenzo shale and limestone. Yields 1.24 tons per acre. · Dark reddish-purple color in the glass. Plenty of aromatic interest with scents of blackberry preserves, black currants, and kirsch with hints of spice and green garden. Tasty core of dark plum and berry fruits with complimentary oak highlights. Richly fruited, crisp and juicy, with noticeably firm, prominent tannins, and a refreshing lift of acidity on the bright finish. The most restrained tannins of the wines tasted here and the most approachable of the three wines. About the same the following day from a previously opened and re-corked bottle. Very good. 13.0% alc., $69. 1.5 acres, 20% slope, planted to a Swan field blend in 6’x4’ spacing. 12”-18” topsoil over soft shale. Yields 1 ton per acre. · Moderately dark reddish-purple color in the glass. With intense swirling, an appealing scent of mixed berry preserves, crushed black grapes, and a hint of floral perfume emerges. The wine offers well-endowed flavors of plum sauce and dark red raspberries, cola and grilled meat. Rather linear now with the fruit buried in flamboyant tannins. There is some earth and mineral infused quality to the fruit which is appealing and I sense that this wine will perform beautifully in another five years. The wine benefited from re-corking the bottle and sampling it the next day. A connoisseur’s wine with unlimited potential. Jim and Judy Schultze left the high-tech corporate world and used their over twenty years of interest and experience in artisan winemaking and winegrowing to create Windy Oaks Estate in the southern Santa Cruz Mountains enclave of Corralitos. Jim developed his winemaking skills in Australia and Burgundy. 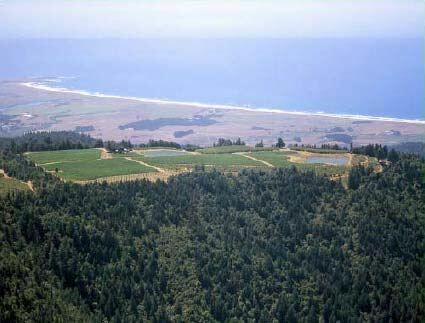 The Burgundian varietals, Pinot Noir and Chardonnay, are produced from a 15-acre estate vineyard located at 1,000 foot elevation on a ridge overlooking Monterey Bay. Viticulture and winemaking at the on-property winery is very Burgundy-themed. The vineyard is farmed according to strict sustainable, organic principles with all the vines hand tended and directly monitored for water status. The site is extraordinary in that it is free of heat spikes, experiences significant diurnal variation in temperature, and has one of the longest growing seasons in California. Jim also farms two other nearby estate vineyards for a total of 26 acres of Pinot Noir. Nine small lots of Pinot Noir are currently released including (from lowest level to top level) Terra Narro, Estate Cuvée, Diane’s Block, Henry’s Block, Wood Tank, Whole Cluster, Wild Yeast, Proprietor’s Reserve and Special Burgundy Clone for an annual total of 2,000 cases. Some wines are only sold to Wine Group members. Jim is very innovative and always tinkering to improve the quality of his wines (note the 5-year air-dried French oak barrel with the gold stays in the photo below). The Schultzes have opened a new tasting room on the property and welcome visitors. The wines are quickly sold to an eager mailing list at www.windyoaksestate.com. Some wine is available on the website. Wine group members receive a significant discount. 14.2% alc., 45 cases, $55. Fermented in one-ton, French oak, open fermentation tanks. Aged 21 months in 45% new French oak. · Moderately light reddish-purple hue in the glass. Shy fruit, with more forward aromas of oak and forest floor. Discreetly concentrated core of dark red cherry and berry flavors with cherry clinging to the fruit-laden finish. Silky textured with impeccable balance. Very good. 13.9% alc., 173 cases, $55. 100% whole cluster protocol is unusual, even in Burgundy. Aged 21 months in 45% new French oak barrels. · Moderately light reddish-purple color in the glass. Remarkably effusive aromas of black cherries, vanilla, musk and spice. Delicious essence of fresh black cherry pie with subtle notes of baking spices, cola, and oak. Almost creamy, with moderate fine-grain tannins. Discreetly rich and fully ripe fruit with a striking note of cherry on the finish. The whole cluster fermentation confers a seductive mouth feel and a charming spice note. Very special. 13.9% alc., 133 cases, $55. Aged 17 months in 65% new French oak barrels. · Moderately light reddish-purple color in the glass. Unique aromatic profile featuring scents of cherries, wild marionberries, oak cask, raisin and fresh fig. The flavors echo the nose with cherry notes that are especially vivid. A riper fruit profile wine with appealing restraint and remarkable persistence on the finish. Very good. 13.9% alc., $60. · Brooding but alluring perfume of black plums, blackberries and black currants. Moderate purple-red color in the glass. Middle weighted but full flavored fruit that really strikes a chord. Offering an array of red and black fruits with faint oak and dark chocolate accents, this sleek and silky wine has a memorable finish with lingering aromatic interest. Best ever Proprietor’s Reserve from Windy Oaks.